The Orthodox Church celebrates the memory of Sts. Euphemia and Melitini on the same day, September 16th. And these two Saints in a paradoxical way both have a certain association with the Greek island of Lemnos, even though neither of them were from there. 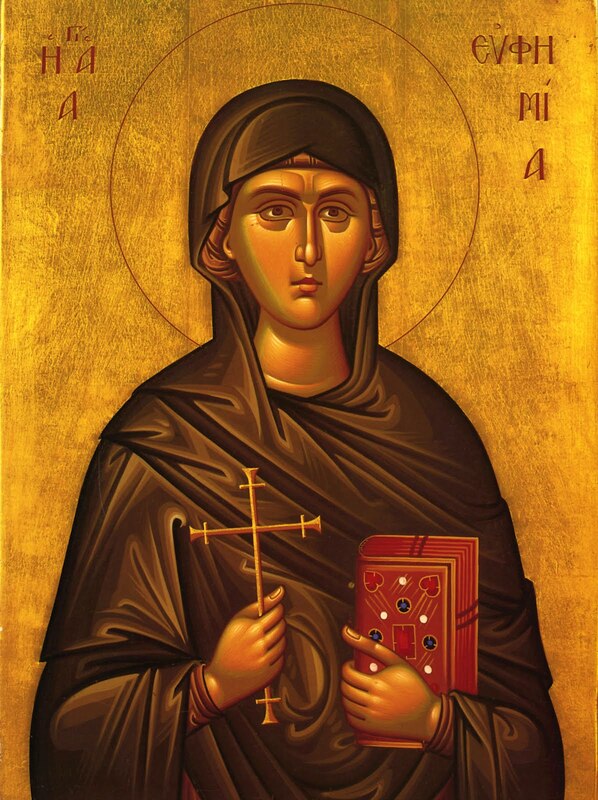 In 770 A.D. the Roman Emperor and Iconoclast Constantine V outlawed the veneration of Icons and Relics, and during this time ordered the much-beloved holy relics of St. Euphemia the Great Martyr, contained in her larnax, to be thrown into the waters of the Bosporus. This larnax which contained the holy relics of St. Euphemia traveled by divine Providence to the island of Lemnos, where the brothers Sergios and Sergonas found it on the shore and the inhabitants kept it safely in the Church of Saint Glykeria on the island. After 15 years, in 760, the larnax containing the holy relics of St. Euphemia was returned to Constantinople by order of the Empress Irene. In Kontias, near the Fakos peninsula, is the Chapel of Saint Euphemia (Αγιαθυμιά), where according to tradition her holy relics were found. In Costantinople, on the feastday of St. Euphemia at the Ecumenical Patriarchate, where her relics are now kept, the priest distributes sewing needles to the women which were blessed over the relics of the Saint, since St. Euphemia is the patron of sewers. St. Melitini, like St. Euphemia, was an early Christian martyr, who was beheaded for her Christian faith in Thrace. A pious Christian by the name of Akakios, having seen her do many miracles, gathered her holy relic and intended to take it to his homeland where he would build a church in her memory. During the sea voyage, however, Akakios became ill and died. Because the sea was rough, the captain of the ship decided to stop at the island of Lemnos for safety, and while there they buried the body of St. Melitini as well as the body of Akakios, forever together by divine Providence. It is thought by some that the homeland of Akakios was in fact Lemnos. The only reference we have to the grave of St. Melitini comes from the Menologion of Basil II from the 11th century. However, the relics of Melitini and Akakios were never found, nor is it known where they were buried. Some say they were buried near Agio Sozon near Fisini. Today there is a church dedicated to St. Melitini in Kallithea, but this church was built on the ruins of an old monastery that was also dedicated to St. Melitini. The reason the place is known as Agio Sozon (Saint Who Saved) is because many years ago certain sailors were caught in a storm and managed to live. Wanting to give thanks for their salvation to the patron saint of the island they landed on, they saw the monastery which they did not know to whom it was dedicated, and because it was anonymous they called it "Saint Saved" or "Agio Sozon". 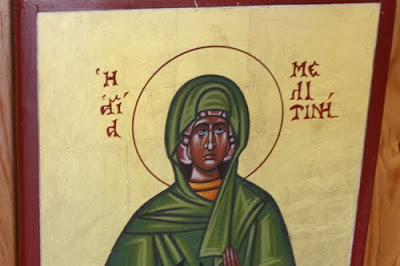 There is also a port named after St. Melitini on the island that may be where the ship carrying her relics landed.